What: Arcades Project is a curated event featuring artists, designers, and independent presses who are reconsidering the idea of text, writing, and the book. The event is part of Spring (W)rites, an annual literary festival in Ithaca, and is founded by visual and literary artists in Ithaca. Call for Vendors: Vendors sell art objects, books, journals, zines, dvds, or games that are priced under $50. Visitors can purchase items and meet the authors/designers/artists behind the work. Call for Artists: Artists are invited to propose installations, performances, or video screenings. Proposals should creatively explore the relationship between literary and visual arts, text and image, or art and shopping. Some financial support for materials will be provided. Call for Workshops: Booth space is also available for informal workshops that introduce book arts related skills and discussion topics to visitors. Application Fee: It is FREE to apply. Participating vendors will be charged a small ($25) fee to help cover the costs and secure your slot in Arcades Project. 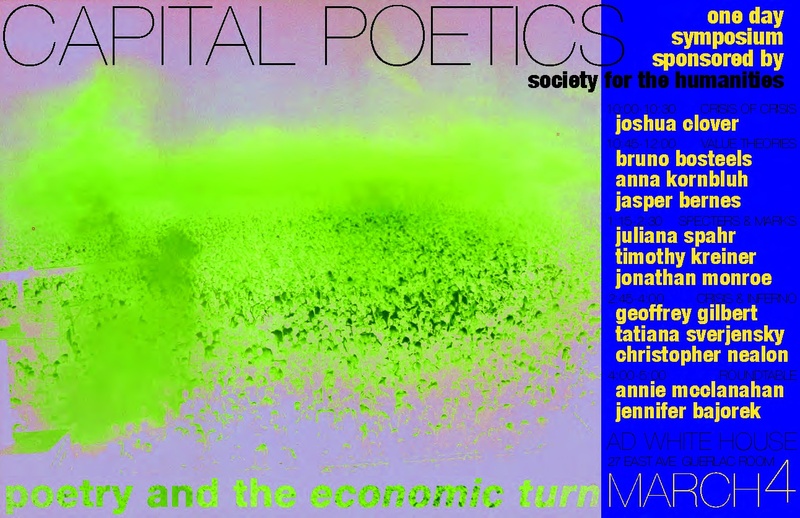 Mark your calendar for this tantalizing symposium on poetry and the economic turn, taking place on March 4th at Cornell. Looks like one not to be missed. Well, so much for the warm weekend in Ithaca I blogged about earlier this week. Yesterday was rather nice, but this is what it looks like today. This is actually a picture of Robert Andrade’s ruined state(s), in a snowstorm. I guess we’ll have to wait a bit longer to find out how the sculpture has weathered the winter so far. Banksy’s documentary ‘Exit Through the Gift Shop’ is up for best documentary at the Oscars next Sunday. Meanwhile, this week in LA, four new works of graffiti assumed to be the work of the elusive artist himself, have cropped up around the city. Not surprisingly, the one pictured above was removed by authorities fairly soon after it went up. You can view the other images – including Charlie Brown smoking a cigarette and about to set fire to a building – here on Banksy’s website. The LA Times seemed to doubt the authenticity of the work, questioning whether Banksy would stoop to the level of engaging in a pre-Oscar publicity campaign. What? You mean Banksy creating subversive art stunts that draw attention to himself in the media? Nah, never. If you’re planning on heading downtown this weekend for the Chili Festival, make sure to pop into the CAP Artspace to check out Josh Sperling’s new show. Sperling was recently selected as one of this year’s NYFA Mark artists representing Ithaca, and I am sure he is destined for a long and productive career. I have been following his work since he first moved to Ithaca after finishing art school about four years ago, and I wrote about a show he had at Gimme! Coffee last March in The Ithaca Times, where I suggested that his work alludes to a kind of NeoModernism, drawing from the philosophical position in which art is considered to be an expression of the most sublime spiritual principles and interpretations of the universe and human existence, where reality is but a mirror of a deeper one that can only be reached through inspiration and imagination. In his latest show, he presents three new paintings: Roses are red, Violets are blue, and Goldenrod is goldenrod. 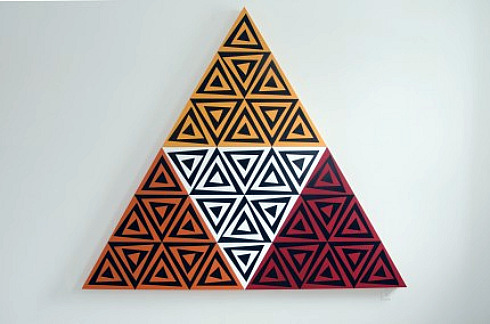 In these new pictures, he continues to channel 1960s Minimalism and the possibilities offered through geometric abstraction, featuring brightly-colored geometric forms that have been enhanced through digital technology. Anyway, if you’re not busy this Monday, Sperling will be giving an artist’s talk at 6:30pm at CAP Artspace, 171 The Commons. The show will be up until March, so there’s still plenty of time to check it out. Today my review of the American Abstract Art show at the Johnson Museum was published in the Ithaca Times. As a result of yesterday’s news, I have been thinking a lot today about Jasper Johns, and consequently, his relationship to abstract art in America. I will begin by admitting that I generally side with the camp that tends to view Johns’ art as embodying the manifestation of the avant-garde – the Duchampian legacy as it were – when art’s leading edge left Paris and came to NY after World War II. And this is not just because Johns was more of a dandy, like Duchamp, as opposed to the hard-drinking hero-figures that characterized the New York School. But, because his art most closely followed the true spirit of rebellion. Like Duchamp, Johns was not afraid to challenge traditional aesthetic values, carrying on the defiant, inquisitive avant-garde ‘tradition,’ creating art that above all embodied content, while opposing established opinion or structure. Was Flag a painting or a flag? Like Duchamp, Johns worked with form and content. On the other hand, the Abstract Expressionists, who dominated the American art scene with their grand, sublime gestures favoring form over content, followed in Surrealist fashion the automatic Zen move. Placing total faith in abstraction’s abilities (as advocated by the modernist critic Clement Greenberg) the New York School, working with copies of Zen Buddhism on their studio tables, used abstraction to preserve art’s autonomy against mass culture in a kind of ‘mute repudiation of capitalist values.’ The Duchampian model faced it head-on. In American art, the post-war avant-garde is perhaps defined by this juxtaposition. Duchamp, the fuel behind every distinct postwar shift in art from surrealism to postmodernism, directly confronted and challenged the maladies of Modernism. Likewise, ‘Proto-Pop’ Johns (and Rauschenberg) also followed an alternate path; remaining rebellious, and open to questioning established structure and opinion. As a result, they were unaffected in a way their New York School contemporaries were not because of the limitations of the form of their expression. Maybe Abstract Expressionism, in its arbitrary subjectivity, simply became too personal to be avant-garde, or to be useful for the future. Today was an important day for the visual arts in America. 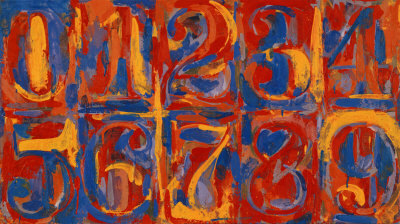 Props to Jasper Johns for being the first studio artist in 34 years to receive the Presidential Medal of Freedom. 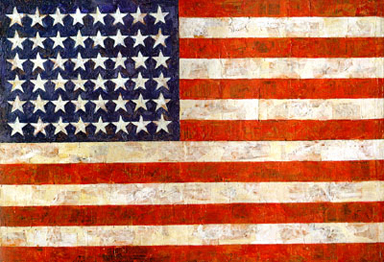 Double props to Obama; for being the third president, along with JFK and Gerald Ford, to give the award to a painter or sculptor, and for awarding it to Jasper Johns. Watch the ceremony from earlier today on the White House website.